May 3, 10, 17, 24 $80 Sign up today! The vocal truth of each individual is dependent upon their physiology, psychology and spirituality, which are all interconnected. Both Yoga and voice embrace and respond to similar spiritual and physical principles. In this series you will learn to use the voice as an addition to your spiritual tools. The voice can start as the symptom but also be the path. 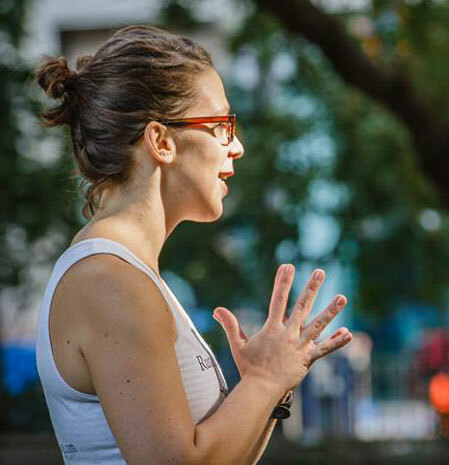 In this series, Aude will introduce principles of voice production coupled with Yoga asana (poses) and pranayama (breathing technique) and vocal exercises to optimize vocal abilities. The series will consist of an integrative approach of the anatomy and physiology of the voice paired with asana and pranayama along with simple vocal exercises. This series is meant for anyone who uses their voice: from teachers who use their voice long hours, to professional singers who sing 8 shows a week, voice students in quest of maximum vocal efficiency. This series will benefit anyone with daily speech needs or artistic and performing practices, anyone who wants a different approach to vocal habilitation or rehabilitation. People who want to learn, improve, deepen vocal technique or use it to accompany an existing voice therapy. Learn to use your voice in a new and deeper way! AUDE CARDONA is a certified Iyengar Yoga teacher who has been practicing for 18 years and teaching for 11. She encountered Yoga in Rishikesh, India in 2001 and has since then practiced and taught in Paris (native), Berlin and New York city where she lives. 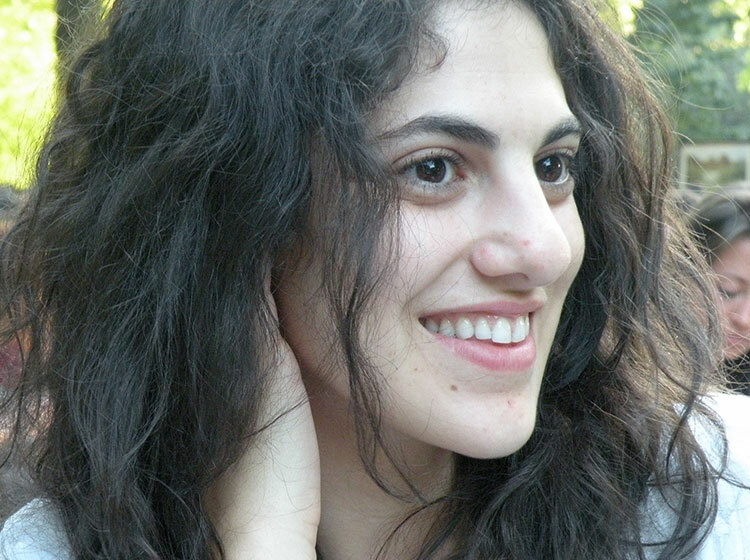 Aude is also an opera singer and graduate from the Manhattan School of Music. She is a certified Vocologist from the National Center of Voice and Speech of the University of Utah. As such, she teaches both Yoga and Singing as well as does research on the correlation between Yoga, Voice and Mindfulness. Her main teachers are Faeq Biria, Genny Kapuler, Carrie Owerko, and Joan White. Aude has a deep interest in yogic philosophy and practices Vipassana/Insight meditation. Her Yoga teaching is inspired by all those disciplines and she hopes to share Yoga as a refuge for oneself. For cancellations up to 48 hours before the series begins, we will refund full amount paid less a 20% administration fee. However, no refunds for cancellations made within 48 hours of the event. Series Dates: April 26, May 3, 10, 17, 24 $95. Sign up today! Confused in the Back Care classes? Don’t understand your back problem? Join our Back Care Beginners Series! Debby Green takes over this series while Eve Holbrook is away! This series will cover the basic skills you need to participate in the Back Care and Back Care Basics classes. An excellent introduction to Back Care yoga for those students who need a weekday class, this series is a great way to kick off the weekend! With other new beginners to Back Care Classes at Samamkaya Yoga Back Care & Scoliosis Collective, instructor Eve Holbrook will teach you many of the basic actions, how to find your alignment, and learn prop adjustments appropriate for your scoliosis, herniated disk(s), kyphosis, lordosis, spondylolisthesis, lumbar or neck pain… or any other back problem. Learning these skills through a series will help you make a commitment to your yoga practice and help you integrate smoothly into the Back Care classes. A certified Iyengar yoga teacher, Eve has been working with beginners for 20 years. She has gained a great depth of knowledge and understanding of yoga for back pain through her work with students, as well as with her own back. 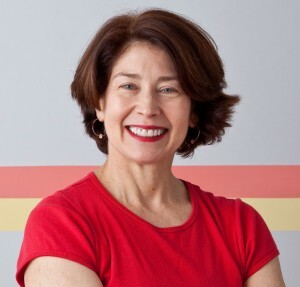 Debby Green has been studying yoga since 1984. When she encountered Iyengar yoga 10 years later, she realized that she would have to start all over again. Her main teachers are Kevin Gardiner, James Murphy and the late Mary Dunn. She travelled to Pune in 2011 to study with the Iyengar family. She teaches a serious subject with lightness and humor, so that students can enjoy the intensity of Iyengar yoga. Debby is also a certified and gifted Rolfer. $5 Trial Class only available to first-time students. For returning students, the cost for the trial class is $15. Series must be paid for in-full in advance. You may join for the 1st or 2nd class. The price will be pro-rated for those joining in the 2nd class. There will be an opportunity to make up 1 missed class. Join our Friday Back Care Beginners Series! Series: April 28, May 5, 19, June 2, 9 $95. Sign up today! Has your doctor told you to watch and wait? Is your child preparing to have fusion surgery, or have they already had fusion surgery. No matter what your child’s situation, the Yoga & Scoliosis for Teens and Tweens class will help address your child’s scoliosis, muscular tension, pain patterns as well as the psychological and social pressures that accompany treatment and therapies in adolescence. This class is appropriate for ages 11-17. All teens welcome are welcome to this class, but as idiopathic scoliosis is commonly diagnosed in adolescence the class will generally focus on scoliosis. This 1-hour class creates an environment that is less intense than the adult classes, allows teens to relate with one another, and is sequenced for a young person’s energy level. Dahlia Galler’s positivity and experience with her own scoliosis will communicate how the love of yoga will lead to a healthier relationship to the body…at a time when this relationship is particularly difficult. Dahlia Galler: While studying at Parsons School of Design, Dahlia worked as a visual merchandiser at Yogaworks. It was there where she practiced her first Downward Dog and learned to let go. In class one day, a friend noticed her scoliosis and recommended that she check out Yoga Union Center for Backcare & Scoliosis. After only one class, Dahlia was hooked. It was at Yoga Union Center for Backcare & Scoliosis where she seriously began her yoga journey, which she sees as a balance between effort and ease, and between hard work and letting go. After completing her 200 Hour RTS Certification with Alison West’s 200 Hours Yoga Union Teacher Training receiving her 200 Hour RYT Certification, she began her apprenticeship with Deborah Wolk, assisting with back care and scoliosis classes. Dahlia lives in New York City and is not only a yogini, but a freelance interior designer and stylist. Knowing that there is no one-size-fits-all pose, she brings a fun, light-hearted, artistic style to her teaching of all levels! $5 Trial Class only available to first-time students. For returning students, the cost for the trial class is $15. Series must be paid for in full in advance. You may join for the 1st or 2nd class. The price will be pro-rated for those joining in the 2nd class. There will be an opportunity to make up 1 missed class. Current Series: April 7, 14, May 5, 12, 19 $95. Sign up today! This series will cover the basic skills you need to participate in the Back Care and Back Care Basics classes. With other new beginners to Back Care Classes at Samamkaya Yoga Back Care & Scoliosis Collective, instructor Ashlee Willaman will teach you many of the basic actions, find your alignment and learn prop adjustments appropriate for your scoliosis, herniated disk(s), kyphosis, lordosis, spondylolisthesis, lumbar or neck pain… or any other back problem. Learning these skills through a series will help you make a commitment to your yoga practice and help you integrate smoothly into the Back Care classes. Ashlee Willaman is a 8 time marathoner, ultramarathoner, an RRCA Certified Run Coach and a 500 RYT. She began practicing yoga as part of her dance training at the age of 13, around the same time she was diagnosed with scoliosis. She learned that yoga kept her back pain at bay and stuck with the practice for the next 20 years. She received her 500 RYT certification from YogaWorks in 2012 and attended a Yoga For Scoliosis Teacher Training Workshop with Elise Miller in October 2014. Having always been a mover and a shaker, when Ashlee stopped dancing she started running and found that she was drawn to long distance running. In 2012 she founded Run Like a Yogi to help athletes infuse training cycles with yoga and meditation. Her alignment-based classes focus on restoring balance to the body in order to avoid injury and recover faster. She teaches at various locations throughout NYC, is a running coach for Hot Bird Running and is on the coaching staff as a yoga instructor for Team Continuum, a charity that provides immediate and vital non-medical assistance to cancer patients and their families when the diagnosis results in disruption, hardship and uncertainty in everyday lives. It is strongly recommended that you pre-register for workshops and series. If you pre-register for a series, you must cancel 48 hours in advance in order to be refunded for that class series less a 20% administrative fee. Please cancel via email (info@samamkayabackcare.com) or call 646.964.5772. Even if we receive the message later, we will go by the time stamp and refund your money if appropriate. If you are ill or there is an immediate family medical emergency, we will of course waive the fee. However, please email us as early as possible, and before the workshop begins, to waive the fee or arrange a credit.